Ireland's Shane Ryan is through to the final of the men's 50 metres backstroke at the World Short Course Swimming Championships in China. Ryan twice broke the Irish senior record today, firstly in the heats, to qualify second for the semi-final. In the first of the semi-finals he posted a time of 22.96 seconds, cutting a further 0.07 off the record set in the heats. "I came in and I was very relaxed, I knew what I needed to do and I knew I could do it," Ryan told RTÉ Sport. "I had the support to do it and I had to try get my hand on the wall. For tomorrow night I have to try and do the same thing, clean it up and do it a bit quicker. "For me I try and do 30 meters under water, that’s why I love short course because I am decent under water, if I nail those under water swimming is going to come easy." Russia's Evgeny Rylov is the fastest qualifier into tomorrow's final which is at 12:30pm Irish time, Ryan is hoping for a top-three finish. "Everyone else is a bit tired. It’s going to be the fourth day of the meet, they have been swimming a lot. Since this is going to be my third race, I’m going to give it my all," added Ryan. "I definitely got the first 25 down, I can clean up the turn and then just come home a bit quicker. I definitely have more in the tank, I have a lane, I have an opportunity, I’ll just go swim and enjoy it." He won the gold medal in this event at the 2017 World University Games and added a bronze this past summer at the European Championships. 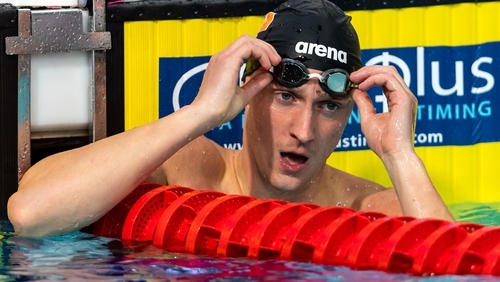 Earlier Conor Ferguson finished 20th overall in the same event registering 23.98 in his heat. Darragh Greene set a new Irish senior record in the men's 200 breaststroke in a time of 2.07.60, breaking Andrew Bree's 11-year long best Irish time. Greene was ranked 21st overall and only eight swimmers advance to a straight final in 200 metre events. ‘I’m delighted with my swim today," said Greene. "My main focus was just to work on my skills and get a personal best in a morning swim, to be able to achieve an Irish record at my first World Championships is a bonus."